Now’s your chance to play dress up and pretend you’re Scarlett O’Hara or Rhett Butler at a ball organized by Give A Little Christmas and a local Reenactment Unit. 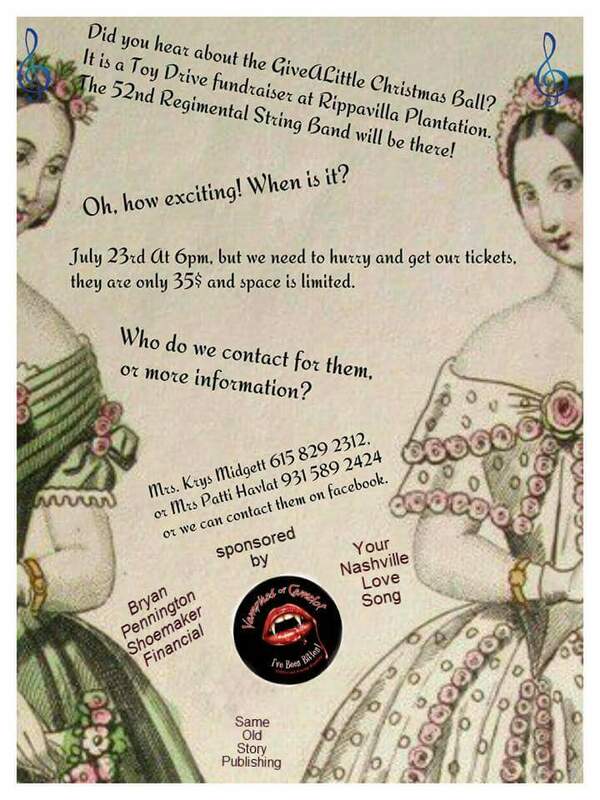 The 52nd Regimental String Band will be performing hits such as ‘Shortnin’ Bread’ and ‘Dixie’ at the ball, held at Rippavilla Plantation on July 23 at 6 p.m. They will even instruct those in attendance on some dances. The outdoor concert will be 1860’s style. Fairly accurate finger foods will be included in the ticket price. Period-specific attire is not required but DJ’s Party Rental in Columbia has costumes available. Reach the store at 931-381-0456. Give A Little Christmas is a project by the magazine “Give A Little Nashville.” It was started by Krys Midgett and Glenn Douglas Tubb (Ernest Tubb’s nephew, aka Santa Claus). The first year, they provided Santa presents for nearly 100 children. Last Christmas, that number increased to over 700 children in the Middle Tennessee area. Toy drives and fundraisers start in July and continue into December. Special thanks to platinum sponsor, Joanne Padgett, author of “The Vampires Of Camelot” series. Her books are available through Amazon, on Kindle and various other online booksellers. Thanks also to Bryan Pennington of Shoemaker Financial, Robert Midgett of Same Old Story Publishing, and Your Nashville Love Song. A very special thanks to Jeanna Bradley, Patti Havlat and their crew for making the costumes, decorations, food and organizing the event. Tickets are $35 per person or $60 per couple. Discounts are offered for groups of 10 or more. For more information or to buy tickets, please call Krys Midgett at 615-829-2312 or Patti Havlat at 931-979-8300.